Love the Grey Tiles, could you please tell me where these are from? They can be purchased through our showroom. I love the basins and tapware - can you please tell me where to buy? 13. 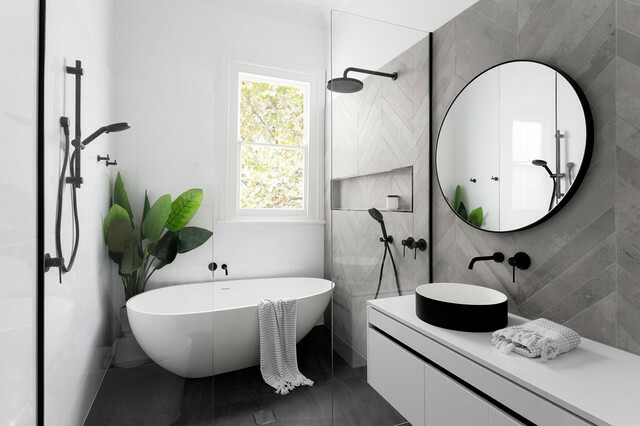 Location: Melbourne, VictoriaWhy we love it: Chevron wall tiles and a round mirror that echoes the curves of the basin and egg-shaped tub. We’re sold. Georgia Madden added this to How Do I... Keep My Bathroom Odour- and Mould-Free? My toilet smells fine… where else could the funky odour be coming from? The water in your bathroom’s floor waste (the central drain on your bathroom floor where wastewater from the shower, hand basin and bath flow into) can evaporate, particularly in the warmer months or if you haven’t cleaned for a while. This means there is no separation or safety seal between the bathroom and the sewer. That nasty stench could be the sewer odours travelling up to your bathroom. To check there’s a seal in your floor waste, shine a torch down the drain. If there is water present, there’s a seal. If it’s dry, there is no seal. If it’s dry, pour a bucket of water down the drain until it fills up. Ventilate the room well, and this should clear up the stench. 31. Location: Brunswick East, VictoriaDesigner: GIA Bathrooms & KitchensFeatures: Concrete continues to appear in homes across the globe – add pattern and concrete gets even cooler. 2. Location: Brunswick East, VictoriaDesigner: GIA Bathrooms & KitchensFeatures: Concrete tiles in herringbone formation – a trend with a twist. 3. Location: Brunswick East, VictoriaDesigner: GIA Bathrooms & KitchensFeatures: Concrete-look tiles became more popular by the day this year.